President of Ghana President Nana Addo Dankwa Akufo-Addo speaking at the Mining Indaba in Cape Town. 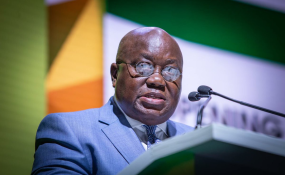 Speaking at the 2019 edition of the Investing in African Mining Indaba, the world's largest mining investment conference, on Tuesday, 5th February, 2019, President Akufo-Addo stated that it is not right that Africa, which is so rich in the minerals that are sought after by the world, should remain inhabited by the poorest people on the globe. "As I said at the ceremony, it is my hope and expectation that, this time round, under the new management of AngloGold Ashanti, the development of Obuasi will reflect the wealth its soil produces," he added. "Communities should be able to examine mining contracts, find out how much revenue has been generated, and how, and on what it is being spent," he said, adding that "long and bitter experience means both sides, African governments and mining companies, have to work hard to gain the trust of the people." With countries like Canada, Australia, the Americas and South Africa having spectacular examples of considerable wealth created amongst individuals and corporations as a result of significant discoveries in far-away lands, President Akufo-Addo stressed that "mining, can help rapidly to grow Africa's manufacturing sector, and be the champion of economic growth on the continent." "We cannot, and should not continue to be merely exporters of raw materials to other countries. The value chain of mineral extraction has great potential for job-creation, and can form an essential basis for the transformation of economies around the continent," he added. "We have established the Ghana Integrated Aluminium Development Corporation, a public corporation, to take charge of the development, with appropriate investors, of the full value chain of our bauxite resources in order to establish an integrated aluminium industry in Ghana," he said. The President continued, "We are also determined to build an integrated iron and steel industry, out of our extensive iron ore and manganese deposits, to serve the needs of our country and region, and, to that end, Parliament, in its current session, will consider and, hopefully, approve the establishment of another public corporation, the Ghana Integrated Iron and Steel Development Corporation, which will, with appropriate investors, take charge of this undertaking." Likewise, he stated that work is underway to exploit the considerable deposits of lithium in the country, stressing that "we hope to establish, in all these new ventures, an equitable balance between our needs and the needs of the investor community." The time, President Akufo-Addo added, has come "for the minerals sector to produce win-win situations for all stakeholders." He urged participants at the Mining Indaba to pay attention to "riches on top of the lands also in the form of a young, vibrant and dynamic population" who are anxious to work, and who, with the requisite skill, represent an extremely positive factor in the rapid development of the continent. "Africa has made the world rich with our minerals, our gemstones adorn crowns and homes around the world, it is time to make Africa prosperous, and enable her people to attain a dignified standard of living. Join us in this exciting project for sustainable economic growth," President Akufo-Addo said.